Kurukulla (Skt. kurukullā; Tib. རིག་བྱེད་མ་, rikjéma; Wyl. rig byed ma) — a female deity of the Lotus family, associated with the activity of magnetization or enchantment. She is usually depicted as red in colour, in dancing posture and holding a flowery bow and arrow. She is also one of the Twenty-One Taras mentioned in the ancient Tara tantras. It should be noted that in her well known mantra, it says Kurukulle and not Kurukulla, yet this is because of the vocative form of Sanskrit grammar. 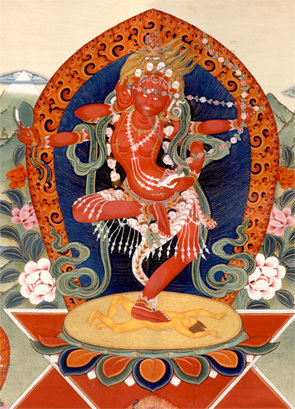 The proper noun in Sanskrit is thus Kurukulla, although Tibetans call her Kurukulle. This page was last edited on 15 January 2018, at 16:01.